Costa Rica Expeditions / What airport should I fly to / from? What airport should I fly to / from? If you have not already bought your international airfare, it’s important that you buy this as soon as possible. 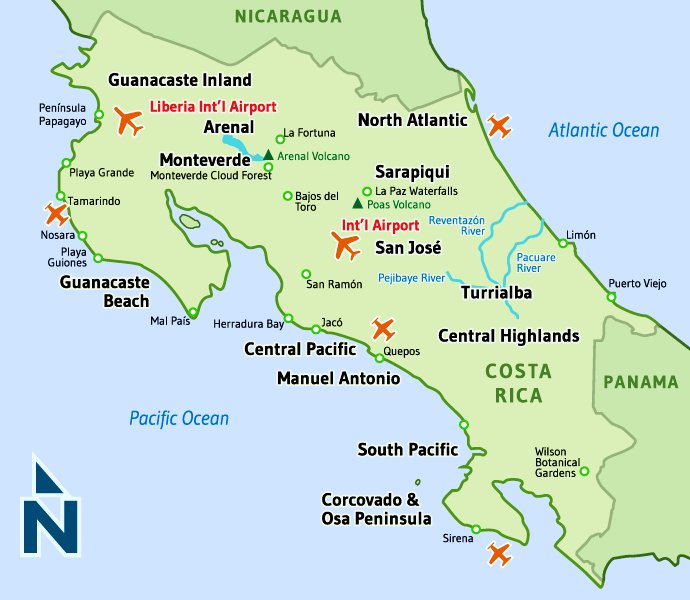 Keep in mind that Costa Rica has two International Airports which are located in very different parts of the country. Your itinerary suggests specific airports for arrival and departure, it’s important that you get the right airports when purchasing your flights. The San Jose airport is in the Central Valley in the center of Costa Rica, the Liberia airport is 130 miles north in the province of Guanacaste close to the north pacific coast. NOTE: If you can book flights that arrive in Costa Rica no later than 2:00 pm and/or depart Costa Rica no earlier than 12:00 noon, you can virtually gain a whole other day of vacation by not having to spend your first and last night in San Jose.